On Saturday 24 August I visited Yeyahu NR with visiting Professor Steven Marsh. I collected Steve from his hotel at 0530 on a beautiful clear, sunny morning and, after a pretty clear run over the mountains past Badaling, we were at the entrance to the reserve by 0645. A juvenile TIGER SHRIKE (Lanius tigrinus, 虎纹伯劳) was a nice surprise along the entrance track, the first time I have seen this species in the capital. Other highlights included a BLUNT-WINGED WARBLER (Acrocephalus concinens, 钝翅 (稻田) 苇莺), 2 SCHRENCK’S BITTERNS (Ixobrychus eurhythmus, 紫背苇鳽), an adult RELICT GULL (Ichthyaetus relictus, 遗鸥) and a juvenile PIED HARRIER (Circus melanoleucos, 鹊鹞). 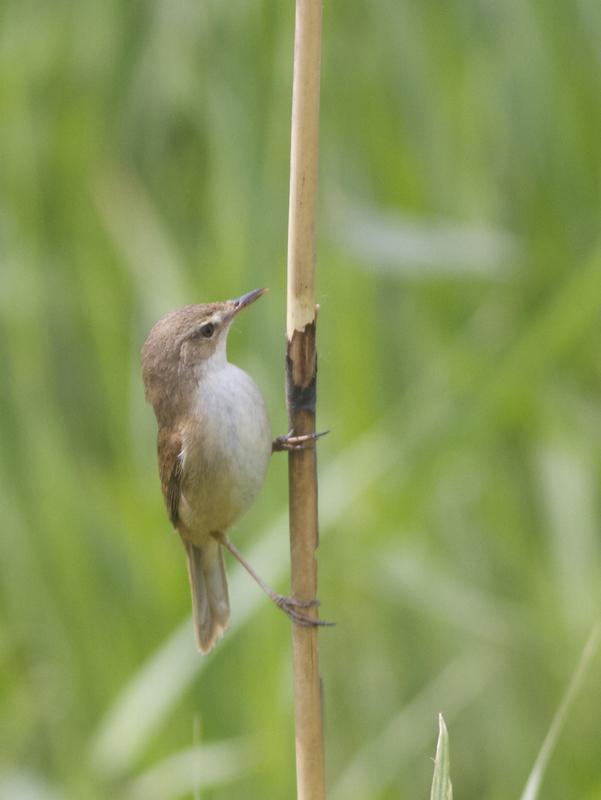 Unfortunately there was no sign of any STREAKED REED WARBLERS (Acrocephalus sorghophilus, 细纹苇莺), the autumn passage of which peaked between 22 August and 7 September in the 1920s, according to La Touche. I shall keep looking! SCHRENCK’S BITTERN – 2 (a pair) – seen in the same place as the male seen in early June – possibly a breeding pair? RELICT GULL – 1 moulting adult. My first autumn sighting in Beijing. TIGER SHRIKE – 1 juvenile. My first in Beijing. BLUNT-WINGED WARBLER – 1, possibly 2. Blunt-winged Warbler (Acrocephalus concinens, 钝翅苇莺) is a strange bird. There are two populations, one breeding in eastern China and the other breeding west of the Himalayas in northern India, Pakistan and Afghanistan. In some places it appears to prefer reedbeds and in other places it prefers dry, scrubby hillsides. For a time some people suspected that the two populations may be two different species, however research has shown that they are, in fact, one. In Beijing, Blunt-winged Warbler is a scarce breeder and passage migrant. It used to breed at the Summer Palace until the late 1980s/early 1990s when the reedbed was “sanitised”. I have found migrants at Yeyahu NR twice in spring and once in autumn. 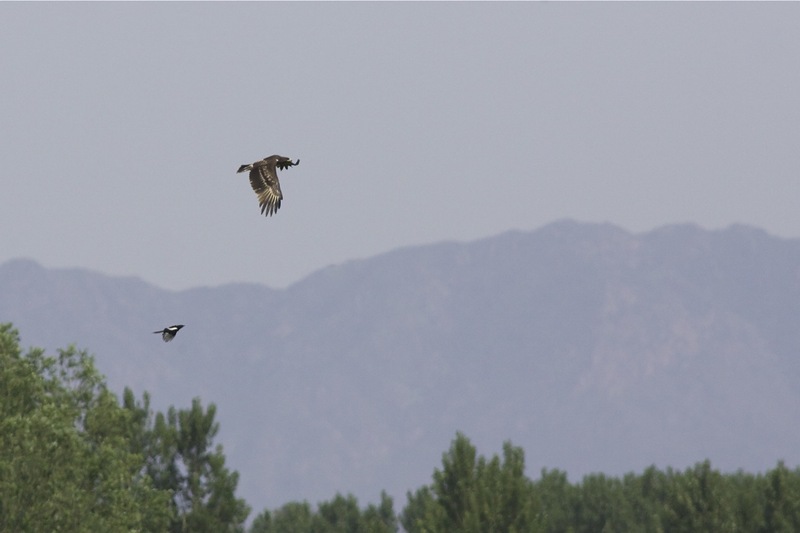 In mid-May I found another singing bird in Hebei Province at the Baer’s Pochard breeding site and Paul Holt found at least 11 singing males at the same site a few weeks later… (clearly, they hadn’t yet arrived when I was there…. cough). 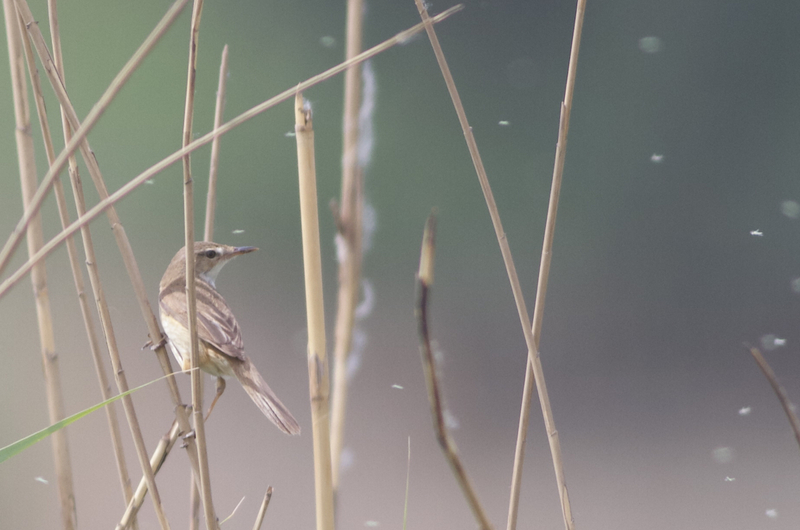 Before I saw this species and Manchurian Reed Warbler (Acrocephalus tangorum, 远东苇莺) I wondered how easy they would be to tell apart. Having now seen both, they are relatively straightforward to separate. Here is a comparative image of the head pattern and underparts of both species (both images taken this Spring). 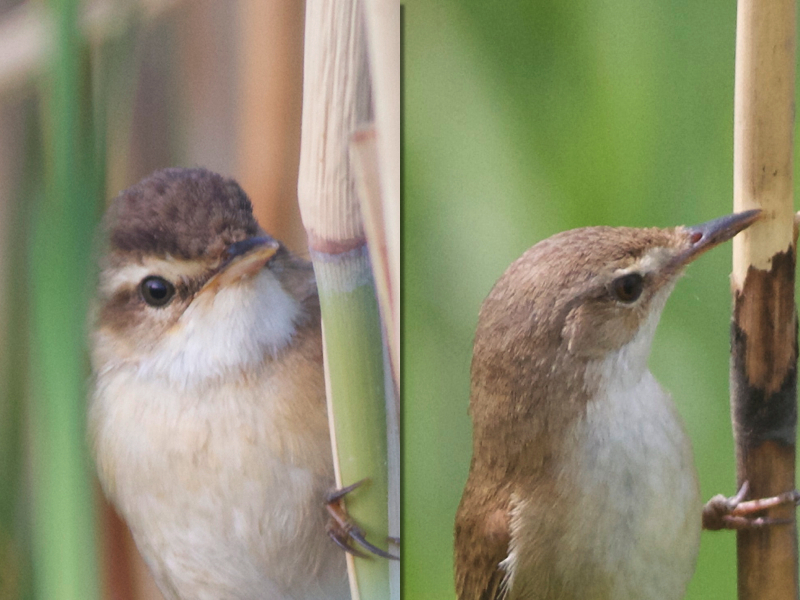 A comparison of Manchuria Reed (left) and Blunt-winged (right) Warblers. Easy, eh? Note the supercilium, which reaches well behind the eye on Manchurian and is barely visible behind the eye on Blunt-winged. Also, note the dark upper border to the supercilium on Manchurian, lacking in Blunt-winged. Other features to note are the obvious pale throat bordered by the buffy upper breast on Manchurian. On Blunt-winged, the pale throat is not as obvious, merging in with the pale upper breast. The darker cap with perhaps darker overall upperparts may be a useful feature, too. The bill is slightly sturdier in Manchurian with an all-pale lower mandible. The songs are typical of Acrocephalus warblers and, with practice, they can be told apart. Listen to Blunt-winged here and Manchurian Reed here. In the sweltering heat (it’s hit 39 degrees C this week), I visited Wild Duck Lake on Saturday. I was hoping for some bitterns (There has been a Cinnamon Bittern in the Olympic Forest Park for the last week or so and Schrenck’s Bitterns have been seen along the Wenyu River in Beijing) and maybe some locustella warblers. I saw very few of the former and none of the latter! But I did see an unexpected variety of raptors with Short-toed and Great Spotted Eagles, Saker, Amur Falcons and spectacular views of Eastern Marsh Harriers. A probable Blunt-winged Warbler was another highlight, singing frustratingly distantly from the boardwalk (dodgy photo below). 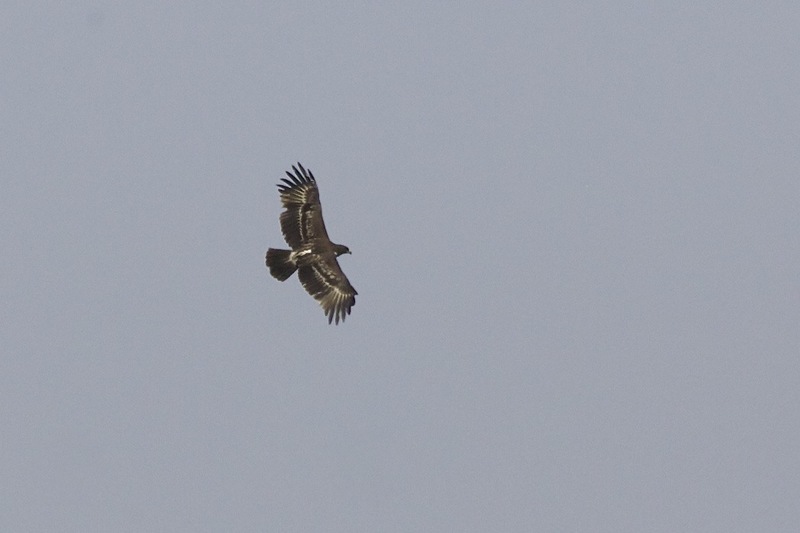 Greater Spotted Eagle, Yeyahu NR, 26 May 2012. A regular passage migrant in Beijing. Amur Falcon (1st summer male), Yeyahu NR. This beautiful falcon migrates through Beijing in large numbers in Spring and Autumn (part of an incredible journey from Manchuria to Africa and back each year) and a few breed in the Beijing area. 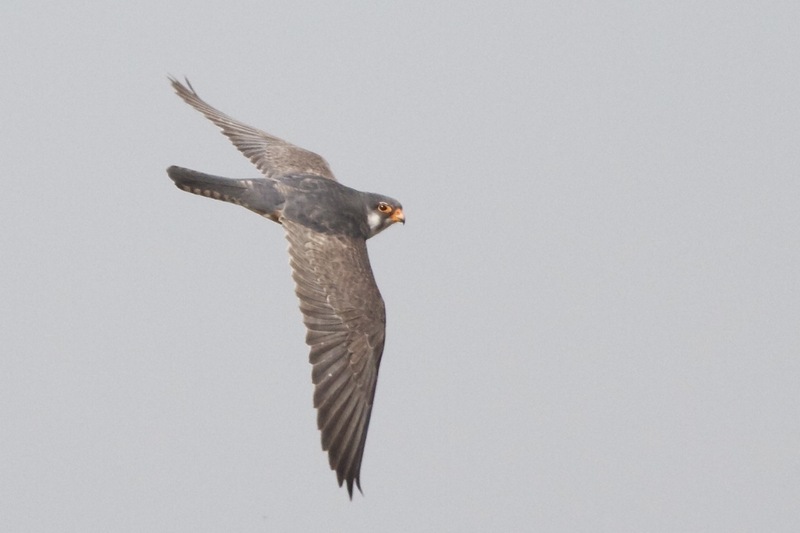 Amur Falcon (female), Yeyahu NR, 26 May 2012. Eastern Marsh Harrier (adult male), Yeyahu NR, 26 May 2012. This guy is breeding in the extensive reedbeds inside the reserve. 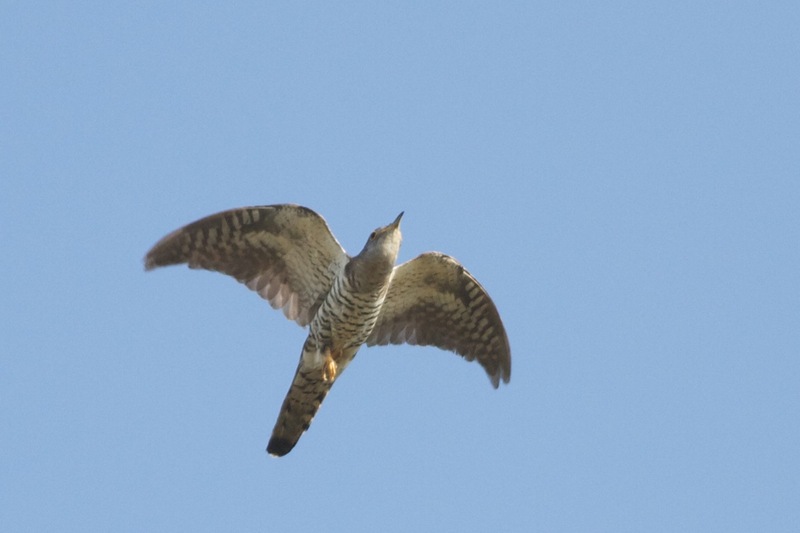 Indian Cuckoo, Yeyahu NR, 26 May 2012. Looks strikingly long-billed and long-tailed in this image. 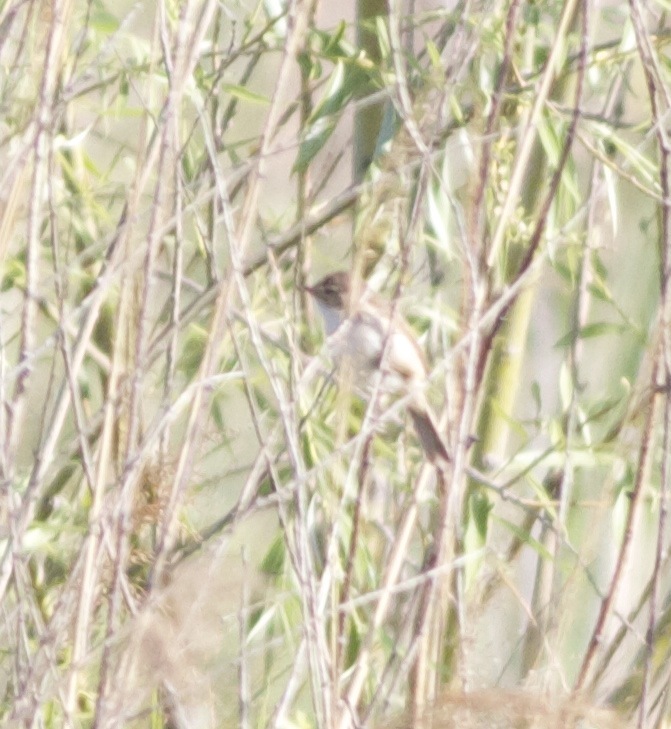 And this is the ‘acro’ that was singing in the shrubby part of the reedbed.. Blunt-winged? The supercilium ends very soon behind the eye… but can I be sure from this image? Unfortunately it was always distant. Probable Blunt-winged Warbler, Yeyahu NR, 26 May 2012. Finally, just for fun, here is a phylloscopus warbler in an unusual pose.. anyone want to have a go at identifying it? 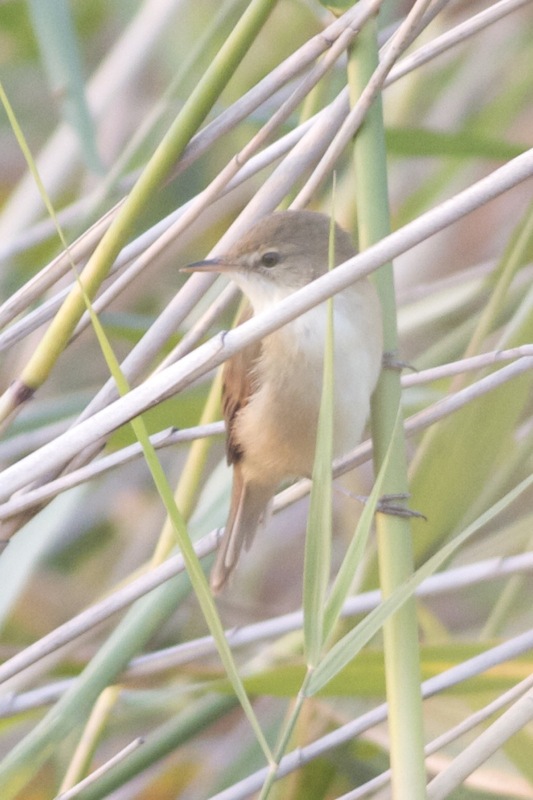 A ‘pylloscopus’ warbler at Yeyahu NR. This image shows enough features for identification.. or does it? Any ideas? Answer later this week. I also recorded a calling crake/rail that I think could be my first Ruddy-breasted Crake.. a little research needed on Xeno-Canto Asia! Full species list to follow. Posted on May 28, 2012 Categories UncategorizedTags Amur Falcon, Blunt-winged Warbler, Eastern Marsh Harrier, Greater Spotted Eagle, Short-toed Eagle, Yeyahu NR3 Comments on Eagles and more.. In June many birders think the marvels of spring migration are over and thoughts turn to butterflies, dragonflies, family holidays or even moths (I kid you not!). 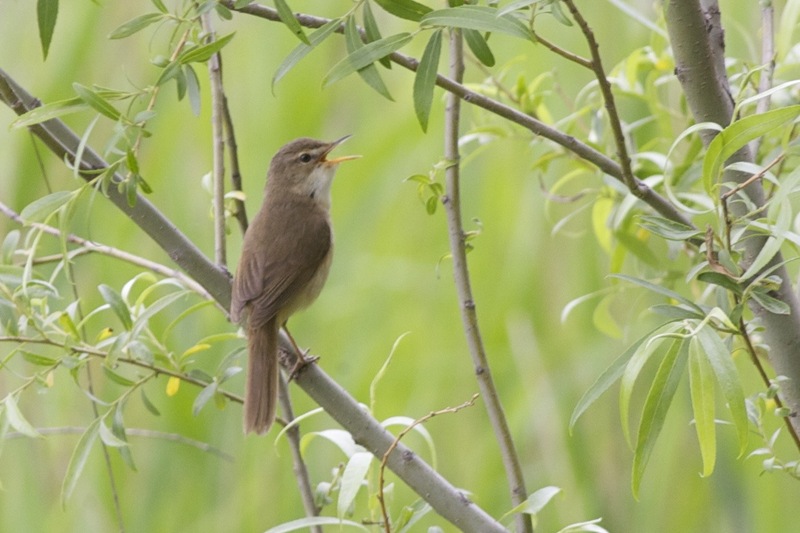 But, here in the Beijing area, early June can be a very good time for the late migrating locustella and acrocephalus warblers, as well as other reedbed-dwelling birds such as crakes and rails. One of the birds that I wanted to catch up with when I moved to Beijing was the Pallas’s Grasshopper Warbler, a bird on many a ‘most-wanted’ list back in the UK and, unless you go to Fair Isle in mid-September, your chances of seeing one in the UK are pretty slim. I have been lucky enough to see over 20 of these birds here in Beijing, nearly all of which I have seen in the last 7-10 days! On Saturday, during a visit to Yeyahu Nature Reserve, we counted 10 of these super-skulkers, at least 3 of which provided us with more than a just a fleeting glimpse of a shape disappearing into a dense reedbed after being flushed from the path! Yayahu Nature Reserve officially opens at 0830 in the morning and is very popular for Beijingers at the weekend to get away from the stress and heat of the city. So if you want to see birds, it’s important to arrive early, before the masses. Ideally you want to be first onto the boardwalk to see any lurking crakes, rails or bitterns before they are flushed deep into the reeds by the noisy hordes. On Saturday, despite arriving at 0520 and finding the gates open (sometimes we have to use the ‘alternative entrance’), we were a little disappointed to see 3 people already on the boardwalk.. nevertheless, we had the place to ourselves for the next 2 hours with some success whilst enjoying the cacophony of reed warblers – mostly Oriental Reed but with the odd Black-browed Reed mixed in. We took our time doing a circular walk around the lake, trying to distinguish any other birds’ songs from the rasping Oriental Reeds, and were rewarded with a single Spotted (David’s) Bush Warbler that was singing intermittently from a patch of young willows, a Baillon’s Crake that we disturbed from the boardwalk and gave us fleeting flight views before it dived into deep cover, a handful of Zitting Cisticolas as well as a good number of the enigmatic Pallas’s Grasshopper Warblers. A pair of Caspian Terns represented a good June record. They came in high from the north and began to hunt over the lake but, by the time we left the site, they had already moved on.. early return migrants? failed breeders? who knows? 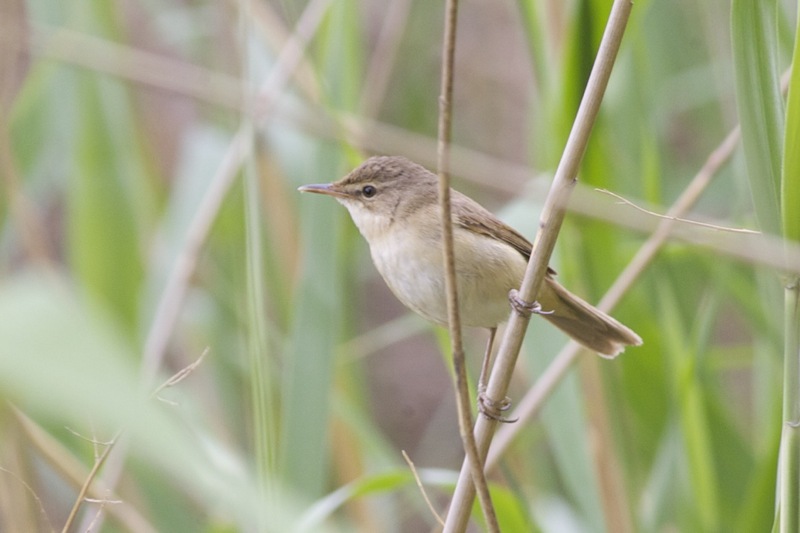 On the second circuit we found a relatively small plain reed warbler (smaller than the resident Oriental Reeds). Our thoughts turned to Manchurian Reed and, fortunately, I had just uploaded the song of Manchurian Reed Warbler onto my smartphone! So I gave it a blast and it reacted strongly, flying closer and proceeding to sing. Nice! I took a few notes and photos before we moved on to eagle field. The walk down to eagle field was hot – the sun had burned off the clouds and there was only a light breeze just about taking the edge off the heat. 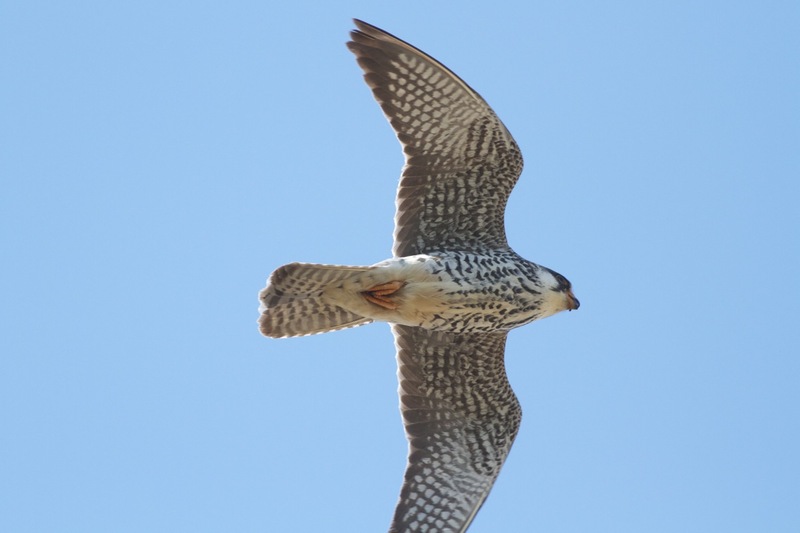 A circling flock of 17 falcons turned out to be a mixed flock of Amur Falcon and Hobby, giving us hope that a larger raptor would likely get up if there was one around… We reached the tower and, after a brief scan, began to have our packed lunches. It was quiet on the reservoir with just a few Night Herons, a couple of Purple Herons, some Mallard and a pair of Spot-billed Ducks. I said to Spike that I would do a thorough scan for any eagles before heading back and, almost immediately, I picked up a large bird of prey heading straight for us from the north-east. It was large, dark and displayed several ‘fingers’ on each hand – it had to be an eagle. 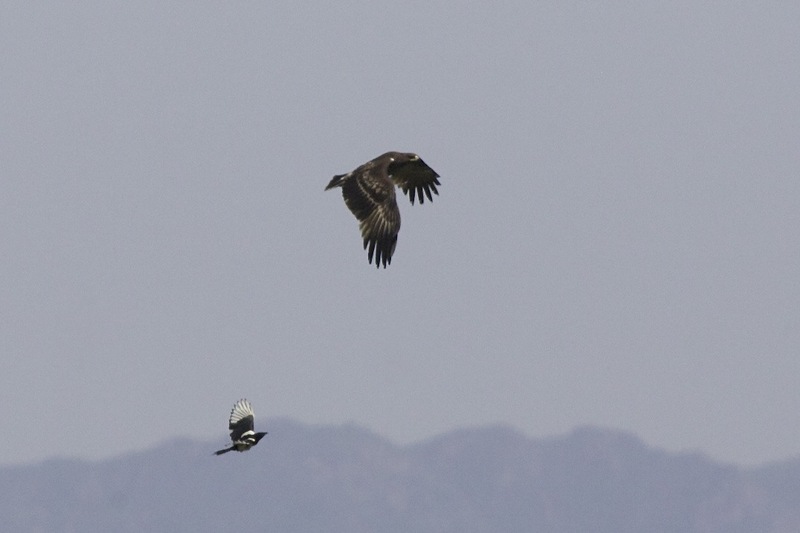 I was pretty confident it was a Greater Spotted Eagle but with just head-on views, I wasn’t certain. We watched it as it came closer and, just as it reached the northern edge of the reservoir, it dropped, stone-like, with legs akimbo into the edge of the reedbed… …wow – that was some dive! We couldn’t see it on the ground but, after only a couple of minutes, it took off and headed low over the reservoir towards us, providing excellent views, at head height, as it attempted to avoid the attentions of one of the local magpies. It was now pretty obvious that it was a Greater Spotted Eagle and, when it reached ‘eagle field’, it began to circle, gained height quickly and headed off south-west. Certainly my best ever views of Greater Spotted Eagle. Any day you see an eagle is a good day. We began the walk back having already had a good day. Then, half way back, we got onto a large bird of prey heading north and away from us.. a quick view through the binoculars revealed it to be a Short-toed Eagle. Almost certainly the same bird that Paul Holt, Chris Gooddie and I saw last week. A good day just got better. A calling Two-barred Greenish Warbler on the entrance track on the way out was our last species of the day and we reflected on another excellent day at this productive site as we met our driver for the short journey back to Yanqing bus station. 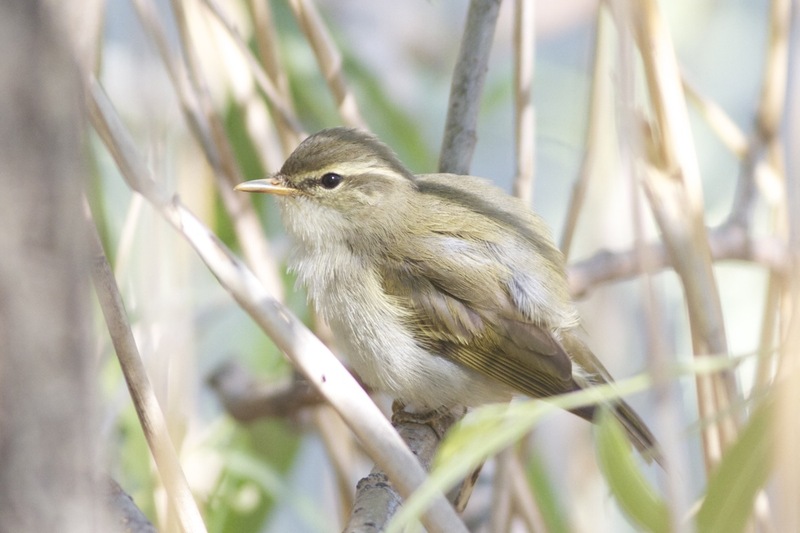 Edit: on looking at the photographs of the presumed Manchurian Reed Warbler, I am now thinking it may be the very similar Blunt-winged Warbler. The supercilium does not reach far behind the eye and lacks the dark upper border that is a characteristic of Manchurian Reed. Even though the bird reacted to the song of Manchurian, I am not sure how reliably this behaviour indicates the species. The two very similar species may well react to each others’ songs – I don’t know! I don’t have any experience of either bird, so comments very welcome..
Red-crested Pochard (3) – a little unsure of the provenance of these regularly seen birds (sometimes seen near the feral ducks and geese but certainly a lot more rangey than the remainder of the feral birds). Amur Falcon (10) – at least 3 adult males and 4 adult females plus some immature birds. David’s (Spotted) Bush Warbler (2-3) – one heard only and one seen only (in different locations). One other possible heard briefly. Caspian Tern (2) – flew in high from the north and began feeding. Not seen later on return. 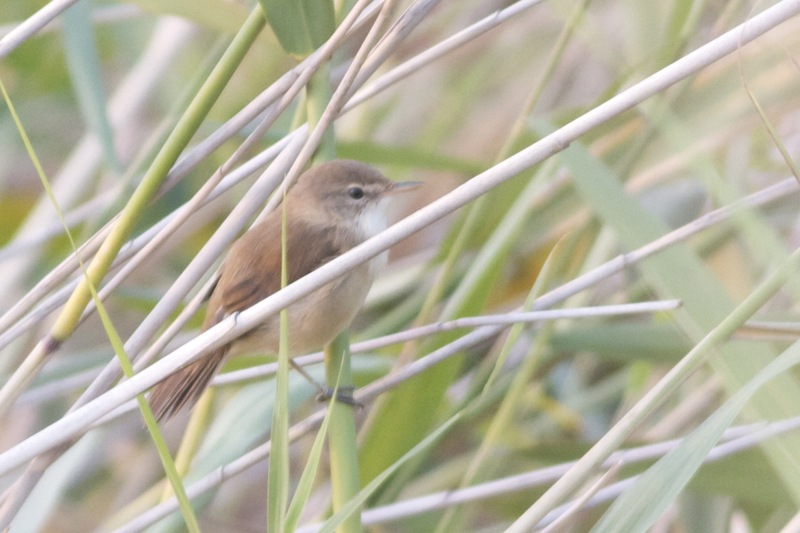 Blunt-winged Reed Warbler (1) – one probably this species. Seen well and heard singing in the reed-fringed dyke to the west of the main lake (just south of the point where the boardwalk ends). 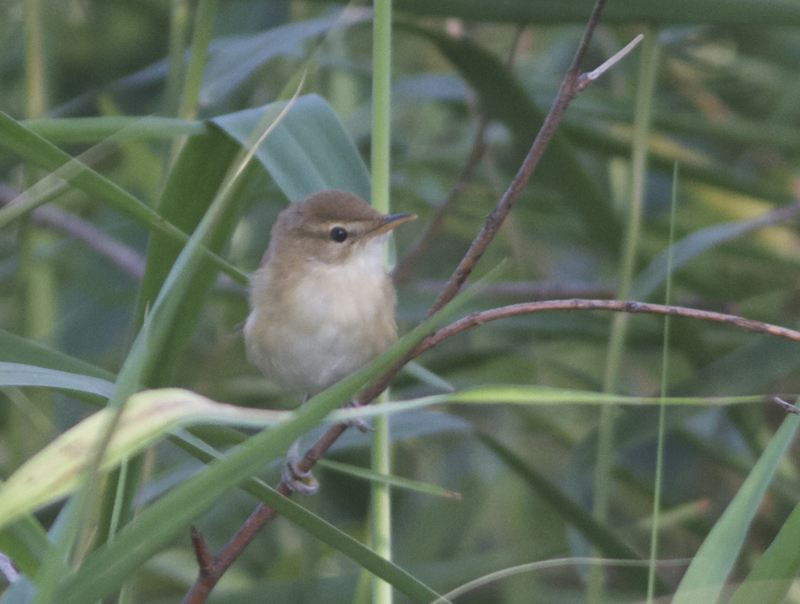 Responded well to playback of Manchurian Reed Warbler (Blunt-winged not played) and we initially identified it as this species. However, photos suggest to me that it is a Blunt-winged Warbler (supercilium very weak behind eye, lacking the black upper edge). I suspect that both species would react to each others’ songs? Comments welcome. 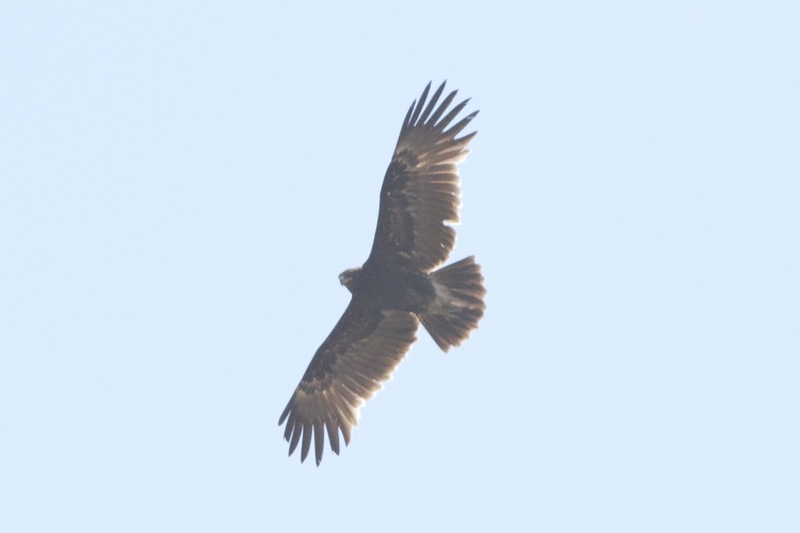 Greater Spotted Eagle (1) – came in from the north-east at around 1315. Subsequently dropped like a stone, legs akimbo, into the edge of the reedbed on the north side of the reservoir (opposite the viewing tower). About 2-3 minutes later, took off again and flew low, in the company of one of the local magpies, across the reservoir and past the tower to the grassy field where it circled, gained height and headed south-west. A probable 2cy bird. See photos. 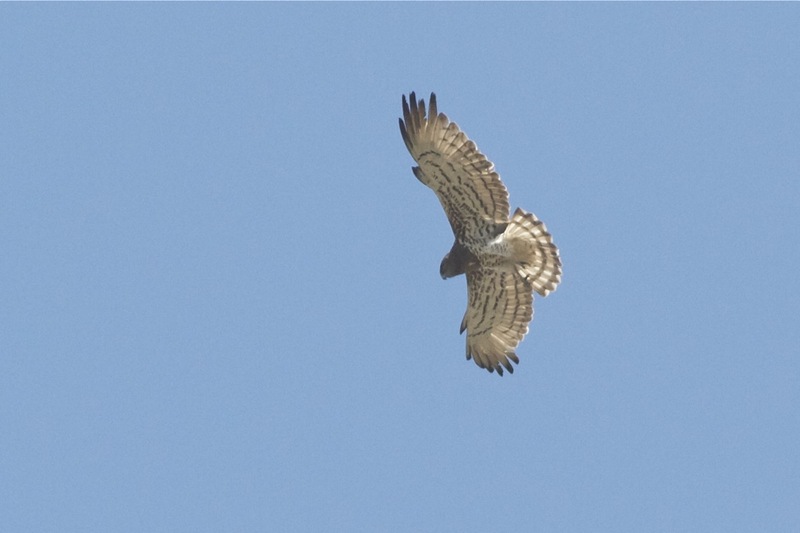 Short-toed Eagle (1) – seen on the walk back to the car park. 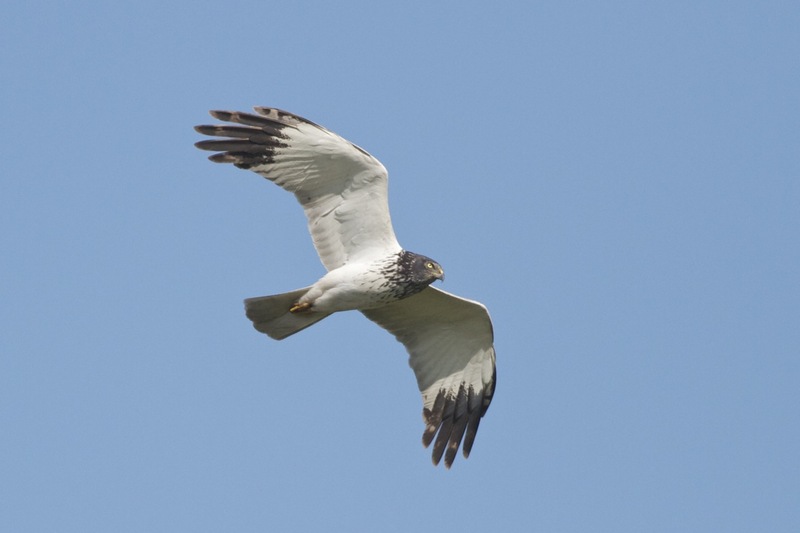 Flew from area east of eagle field and then seen soaring north-east of eagle field close to mountain ridge.